The snakes of the Baldwin Hills area are important actors in the ecology of the area. These snakes provide valuable pest and insect management that often benefit the human communities around the natural area. Many visitors to the Baldwin Hills raise concerns over the possible presence of venomous snakes, yet there is no need for alarm. In the last few decades no venomous snakes (including rattlesnakes!) have been found by anyone in the Baldwin Hills, including during extensive biological surveys. The Gopher snake is a non-venomous snake that can be frequently found in the Baldwin Hills area. This snake is often confused for the western rattlesnake it not only shares a color pattern with the rattlesnake, but also mimics the behavior of its lethal counterpart. 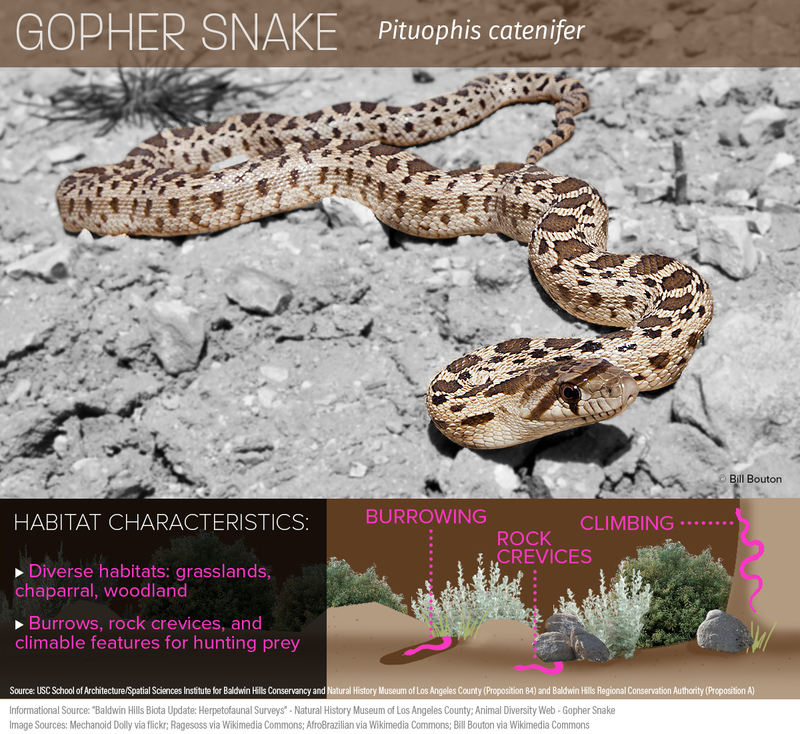 When threatened, a gopher snake will manipulate the size and shape of its body, hiss loudly and whisk its tail through dry grass in order to mimic the look and sound of a rattlesnake. Reported sightings of rattlesnakes are probably the result of misidentification, because non rattlesnakes have been found in any biological research in the Baldwin hills area despite hundreds of hours in the field. 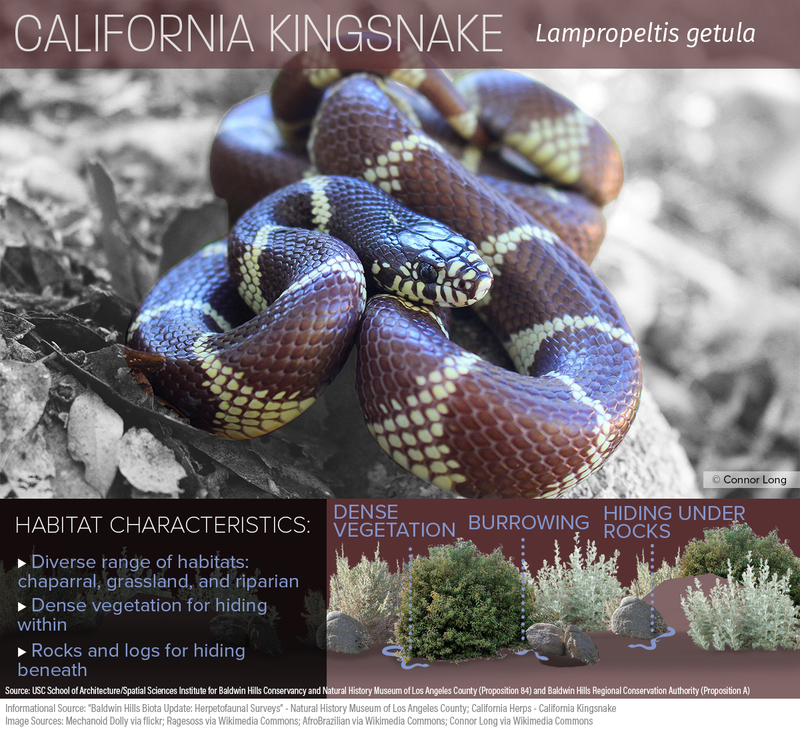 The California Kingsnake survives in a diversity of California habitats. When strolling through coastal sage scrub, oak woodlands, chaparral and the last remaining riparian habitats one might be able to spot a California Kingsnake underneath rocks or other materials that provide the nooks and gaps desirable for snakes. The California Kingsnake is a subspecies of the common Kingsnake, and remains to be one of the more popular snakes for human captivity. Like all other Kingsnakes the California Kingsnake is non-venomous and relies on powerful constricting muscles to capture and kill its prey. The Coachwhip is a species of nonvenomous snake found in the United States and northern portions of Mexico. 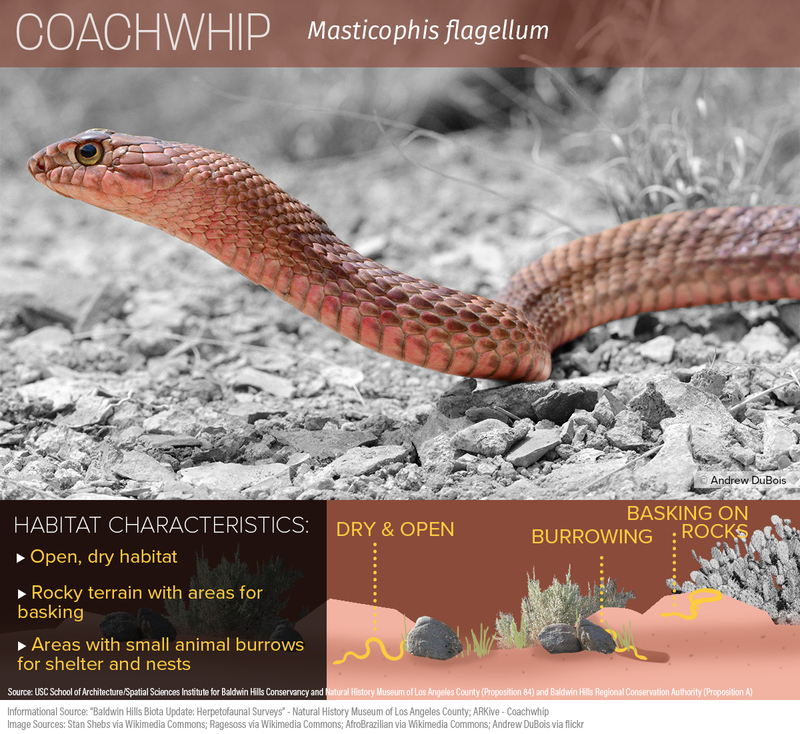 The Coachwhip prefers Los Angeles’ more open environments of coastal sage scrub and chaparral habitats, where it feeds on small birds, rodents, and lizards. These snakes are quick, and seemingly curious. In some instances people have reported them raising their heads above the surrounding habitat in order to to seek out both predators and prey. A series of observations of what appears to be one individual Coachwhip at the Baldwin Hills Scenic Overlook have been documented in the past two years. 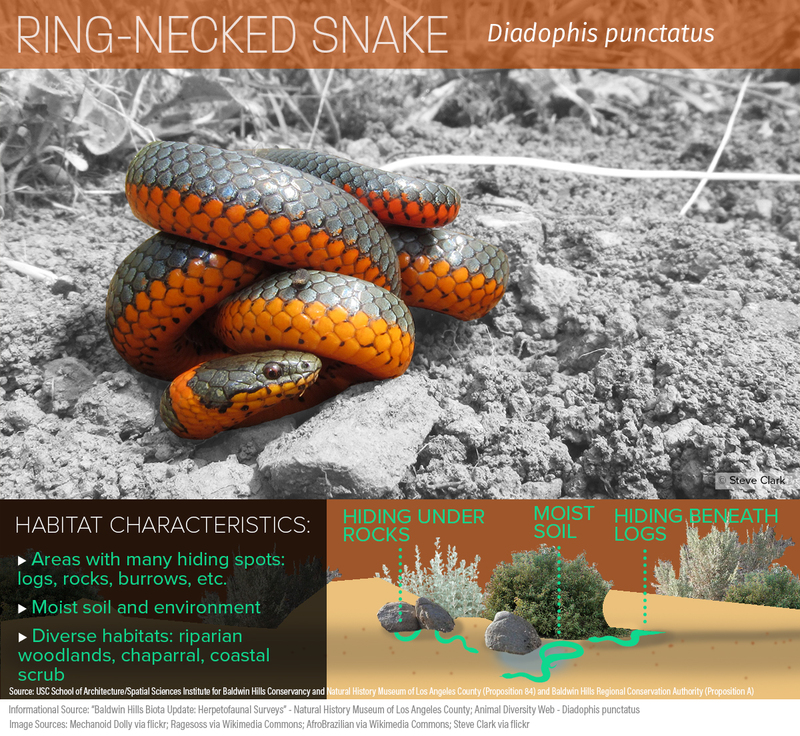 The Ring-necked Snake can also be found in a variety of Los Angeles’ habitats, including the alluvial scrub, chaparral, oak woodland, riparian habitats and coastal sage scrub. Within these different habitats the Ring-necked Snake tends to favor moist areas with ample spaces underneath rocks, logs, human buildings or anything that offers additional protection. Typically sightings of this snake tend to be rarer in the warm summer months, as the Ring-necked Snake prefers more moist environments. The species has been recorded at Baldwin Hills Scenic Overlook.